When you turn to Williams Lifts for wheelchair ramp installation, you can expect service in a matter of days — not weeks, or months. We understand that when you need a mobility solution time is of the essence. However, getting a wheelchair ramp is not something you want to rush into. While we promise fast and efficient wheelchair ramp installation, we also promise to do the job right. In order to do the job right, we need to work with you to find the best solution. Getting a ramp installed in a day or two is not good service if it’s not a ramp you’re completely satisfied with. Let’s first assess your options and discuss what we’ll do to make sure you end up with the perfect ramp for your home. Before going ahead with the wheelchair ramp installation, we will come to your home to fit you with the best option. Modular Ramps: Equipped with a non-skid surface on stainless steel hardware. Built to support a 1000 lb weight capacity. Threshold Ramps: A lightweight yet durable free-standing ramp designed for doorways, sliding glass doors and raised landings. Portable Wheelchair Ramps: Portable, aluminum suitcase ramps available in 2” – 8” sizes. Tri-Fold Ramps: Flexible ramps that can fold up for easy transportation. Pathway Ramps: Ramps built to accommodate entrance or pathway obstacles such as stairs or curbs. Only after finding the best wheelchair ramp option for your needs will we even discuss the next steps. Once you’re happy and confident with your choice, it’s then time to proceed with our stress-free wheelchair ramp installation process. Wheelchair ramp installation may seem like a daunting task, but our experienced technicians can make it happen within a matter of hours. One of our main compliments from customers, which you can see here on our reviews page, is how fast and easy it is to get a wheelchair ramp or stairlift installed by one of our experienced team members. 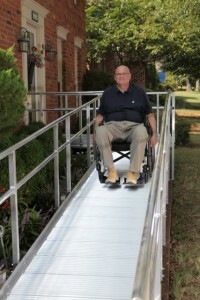 Before we leave your home we make sure to provide you with guidelines and safety tips for your new wheelchair ramp that will help you use it in the safest and most efficient way possible. We treat each installation as more than just another job, we’re helping you improve the home you love. We take pride in providing you and your family with a product that will make your home feel like home again. Keep in mind that if you only need a ramp temporarily, we are one of the only companies in New Jersey offering wheelchair ramp rentals. And yes, if you rent a ramp from us we will take care of the installation and removal as well! If you’d like to learn more about wheelchair ramp installation in New Jersey, please call us today for a free estimate or brochure at 908-322-7070.